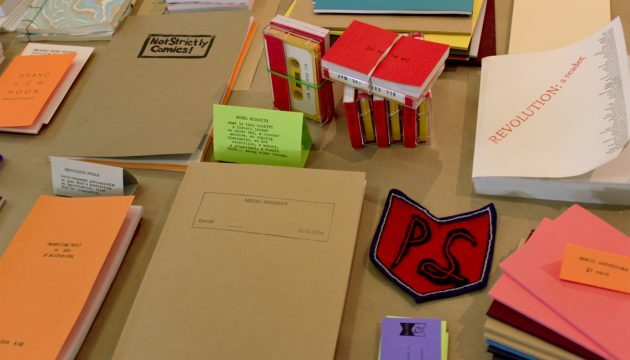 What is a Publication Studio? Publication Studio prints and binds books by hand, creating original work with artists and writers we admire. It serves as a space for publication in its fullest sense: it doesn’t simply produce books, but also brings people together through the shared experience of reading. Every book is made one at a time by hand as needed. You walk into our storefront and say you’d like a certain book, we make it, and then hand it to you in exchange for money (more like a bakery than a traditional bookstore). We attend to the social life of a book using any means possible to expand its circle of readers: physical books; social media presence; eBooks; and wild social events. This breathes life into the written word on paper, online, and through discussion. PS Guelph is one of several sibling studios around the world that work under the shared concept of Publication Studio. The PS family includes: PS Bordeaux, PS Rotterdam, PS Guelph, PS Los Angeles, PS Malmö, PS Oakland, PS Edmonton, PS Portland (OR), and PS Vancouver. Publication Studio Guelph is a hub for gathering formally and informally. For red-hot details about book launches, re-binding evenings, paper marbling workshops, deep reading events, flip-book-making sessions, and bookbinding nights, visit our Facebook page or come chat with us in person by appointment. What is Publication? A talk by Matthew Stadler from Publication Studio on Vimeo.